A new study by researchers at the University of Pennsylvania, analyzing data from a survey of 155,877 participants, has found that contrary to popular belief, people in their 70s and 80s actually reported better sleep — less sleep disturbance and less tiredness/ lack of energy — than younger people. In fact, the researchers found that, with one exception, self-reported sleep quality appeared to improve with age. The one exception was that the highest number of sleep disturbances and events of tiredness/lack of energy per two-week period were reported by middle-aged adults, especially women between the ages of 40 and 59 years. The oldest group of participants, octogenarians and older, actually reported the fewest sleep disruptions or instances of tiredness. The new study was published in the March issue of the journal, Sleep. The researchers analyzed data collected in the 2006 Behavioral Risk Factor Surveillance System (BRFSS) study, which surveyed 155,877 participants who responded to questions related to Self-Reported Sleep Disturbance (SLEEPDIST) and Self-Reported Tiredness/Lack of Energy (TIREDNESS), as well as questions regarding age, race, general health, depressed mood, income, and other matters. The study’s principal author, Dr. Michael Grandner, said the original reason for undertaking the study was to confirm the commonly held hypothesis that sleep quality declines in old age. The researchers divided the study participants in two groups: those who reported 6 or more nights or days of sleep disturbance or tiredness/ lack of energy per two-week period and those who reported less than 6 nights or days of such sleep disturbance or tiredness in a two-week period. After controlling and adjusting for race/ethnicity, income, education, and time since last medical checkup, the researchers then analyzed the data to determine the relationship, if any, between extent of complaints about sleep disturbance and tiredness/ lack of energy and the age of the participants, as well as other factors such as depression and general health. As expected, poor general health, mild depressed mood, and moderate/severe depressed mood were found to be associated with higher reports of sleep disturbance and tiredness/ lack of energy. However, contrary to the researchers’ expectations, they found that both reports of sleep disturbance and reports of tiredness/ lack of energy generally declined with increasing age across the life span, with fewest complaints in respondents older than 80 years. The one exception they found was that sleep complaints rose during middle age years for both men and women, and more markedly for women. The men in the study reported declining instances of sleep disturbance and tiredness as their ages rose from 18 to 54 years, slightly increased sleep disturbance and tiredness for men aged 54 to 59, and then again declining sleep disturbances and tiredness for men after age 59. The pattern for women was similar, except that women aged 40 to 59 reported a more marked rise in both sleep disturbance and tiredness during these years than men. “Across all age groups, women reported more SLEEPDIST [sleep disturbances] and TIREDNESS [tiredness/ lack of energy]” than men, the researchers reported. “Advancing age was not associated with increased Self-Reported Sleep Disturbance or Self-Reported Tiredness/Lack of Energy. These results suggest that the often-reported increase in sleep problems with age is a nonlinear phenomenon, mediated by factors other than physiologic aging,” the study authors concluded. “These results force us to re-think what we know about sleep in older people – men and women,” Dr. Grandner said. However, as a possible alternative explanation for the findings of the study, he suggested to the BBC that it was possible that older people were sleeping worse, but simply felt better about it. “Even if sleep among older Americans is actually worse than in younger adults, feelings about it still improve with age,” he said. Other experts, as reported by the Huffington Post, affirm that sleep problems in older adults should not be written off as a normal sign of aging. They may be indicative of other health issues, which should be checked out. 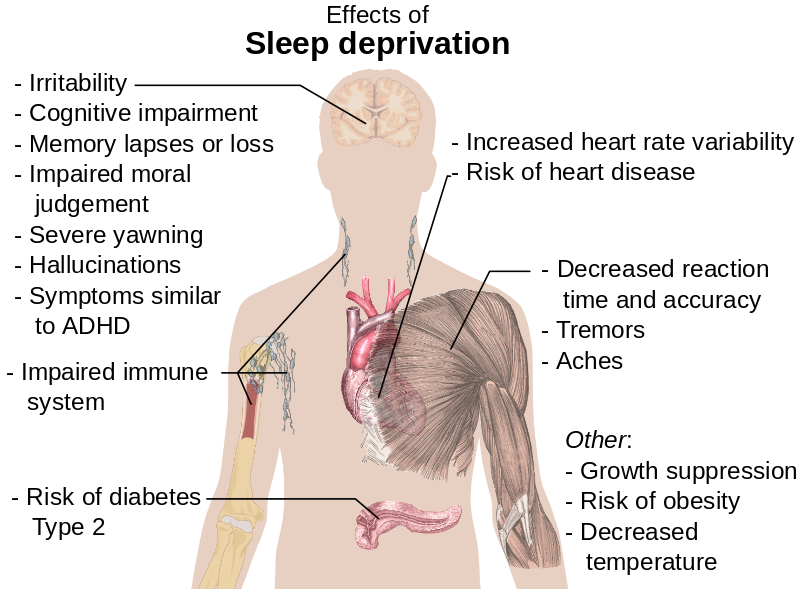 See a graphic showing the potential Effects of Sleep Deprivation (image courtesy of Wikipedia).